I’ve mentioned before that I went on a big Smoothie Kick this summer for my lunches. (Yes, it deserves capital letters, I had a smoothie for lunch for over 6 months…) This was a great way to reduce my Decision Fatigue, ensure complete nutrition, and in the end I lost some weight. By using a blender for smoothies and soups, we make the meal a lot easier to consume. For those with busy schedules, you can get great, fresh, local nutrition quickly and easily. For those with digestive issues, blending can make meals gentler on the system since the ingredients are already broken up. Join me this Saturday during the Revelstoke Farmers Market with Alexandra (Alex) Sosnkowski of Your Whole Health Solutions. We’ll be talking about easy tips to get your nourishment through a blender, in smoothies, dips and soups. 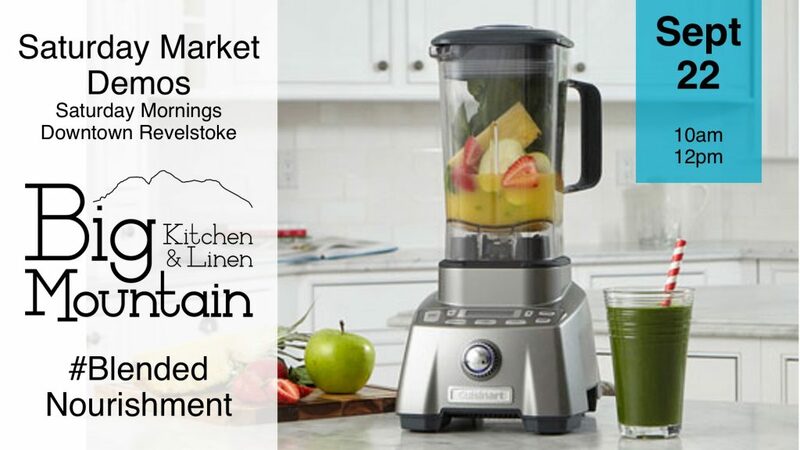 We’ll compare the different types of blenders, and you’ll get a chance to taste the texture difference between them. I’m looking forward to the various topics that come up as we chat with the market goers! Please note, if the weather is spotty, we may move inside the store. Be sure to pop in to say hi if you don’t see us out on the street!! This event is part of a full lineup of Workshops and Show & Tell events throughout the Market Season. Get connected on your favourite social media network, or sign up for our email community to stay in the loop for the workshops you’re looking forward to. We’ll be posting the videos and key takeaways after each event, so if you miss the chance to be here in person, you can still gain the knowledge! Bring (or submit) your questions, bring your tools, and we’ll give you our recommendations! The live feed will be on Facebook through the event and our business page, and we’ll update this post afterwards with the video itself. This entry was posted in Saturday Markets and tagged GadgetGuides.